Mikrotik RouterBoard Universal Indoor case (3 holes for Nfemale Bulkhead connectors or Swivel antennas and a hole for USB). This new revision is slightly higher, to fit more miniPCI card models. Ships with different face plate stickers, to match used ports. Plain black case with no Mikrotik branding. Wall mount slots in base. OEM Mikrotik Rack Mount Kit for RB4011 Router - black finish with screws Mikrotik mANTBox 12s RB911G-2HPnD-12S 2.4GHz 12 dBi 120 degree Dual Polarity Sector antenna with integrated Radio - New! 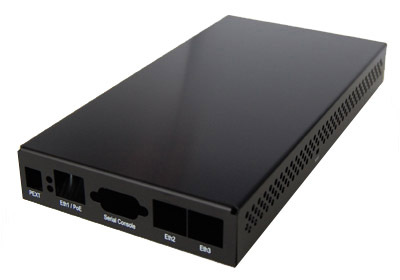 Mikrotik RouterBoard RB4011iGS+5HacQ2HnD-IN (Export version) Powerful 10xGigabit port router with a Quad-core 1.4Ghz CPU, 1GB RAM, SFP+ 10Gbps cage, dual band 2.4GHz / 5GHz 4x4 MIMO 802.11a/b/g/n/ac wireless and desktop case - New! Mikrotik RouterBoard wAP LTE kit - (just add LTE card of your choice) - New! Mikrotik Cloud Router Switch CRS328-4C-20S-4S+RM SFP switch, 20 SFP ports with 4 SFP+ cages and 4 combo ports in a 1U rack mount case - New! Mikrotik ACGPSA is standalone active GPS antenna, that works in 1575.4 MHz spectrum - New!